The Colombian Amazon is now legally a person, and a group of Colombian youth—ages 6 to 26—made it happen. Camila Bustos is one of them. She was in high school when she realized the severity of climate change. Now, Bustos is 25 and doing legal research for Dejusticia, an international human rights organization that’s made environmental justice one of its pillars. That means taking the Colombian government to court over its response to climate change and the deforestation of the Amazon, which contributes to the global crisis. Miraculously, when she and 24 other youth plaintiffs did just that in January, they won. 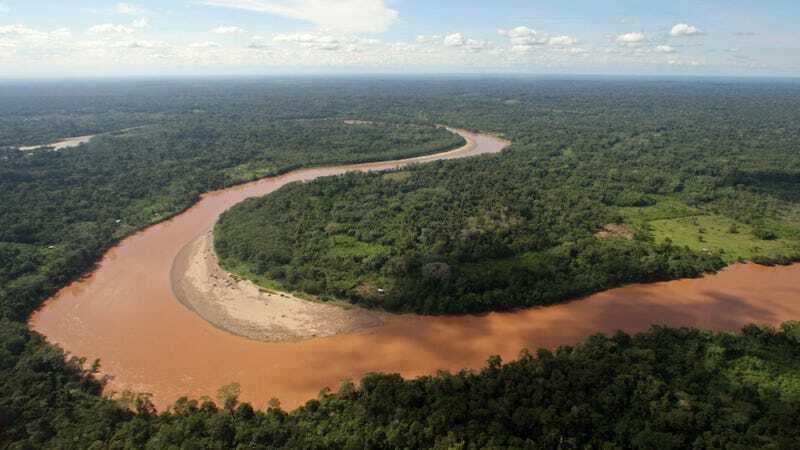 The Colombian Supreme Court ruled Thursday that the Colombian government must create a plan to combat deforestation in the Amazon, as well as climate change impacts in the country overall. With just four months to do so, the court has ordered the government to take a community-oriented approach and work with both plaintiffs and the country’s most-impacted residents. The government also has five months to put together an intergenerational pact for the life of the Colombian Amazon. In 2016, Colombian officials made a similar decision regarding the Atrato River in the country’s northwest corner. Last week’s ruling is truly extraordinary though—in fact, this ruling is a first among this kind of “nature-as-person” climate litigation. The court based its decision on people and on future generations, not on the trees or the plants. A growing body of litigation is using future generations as an argument, but none have resulted in legally granting a piece of nature personhood. Of course, the Amazon is not a human being. Obviously. But making something (legally) a person gives it fundamental rights to keep human beings from abusing it. This gives nature’s guardians the ability to sue on its behalf if others are mistreating it through pollution or, in this case, deforestation. We’ve seen this happen across the world: in New Zealand, Ecuador, and India. Some people have their criticisms of this legal approach, but many environmental attorneys see it as the only way to protect nature—be it a river, forest, or even animals—from the threats people bring. In fact, Lori Marino, a neuroscientist who has worked with the Nonhuman Rights Project, would argue that this legal avenue is one of the last options to address climate change and the mass extinction event we’re seeing. Her work involves protecting chimpanzees, using science-based evidence to argue that chimpanzees are persons. On the one hand, she says the strategy has merit because nothing else is working. On the other, some animals like chimpanzees really have characteristics that merit their designation as persons in the eyes of the law. Giving an animal or an area of nature rights skips over all the negotiations that could come with attempts to preserve it. It makes protecting it non-negotiable. “It’s a way to say, ‘Hands off!’” she said. This Colombian Supreme Court decision could end up in a higher court, the Constitutional Court, but that would happen by request of either the defendants or plaintiffs. If the ruling is settled there, then, it becomes final-final. That would really change the game. Update 4/9/18 2:11 p.m.: This article has been updated to elaborate and clarify two hypothetical arguments for nonhuman personhood that Marino presented to Earther.